The story of my life is bound up in the story of my parents, their life in the cemetery. 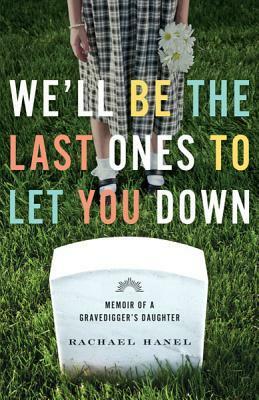 Described as macabre and lyrical, Rachael Hanel’s memoir is about life, death, cemeteries and her father’s unexpected and timely death. While he took his responsibility to the dead and their loved ones seriously, Paul’s sense of humor showed in his business’ tag line: We’ll be the last ones to let you down. Rachael recalls him putting that tag on tons of promotional items. As a marketer, that makes me very happy. Once her dad embarked on his career, death and cemeteries became a part of him, his life and his family’s lives. After spending countless hours riding her bike through the cemetery as her parents worked, she became very fascinated with macabre books of all kinds–true crime, ghosts and the like. She spent hours finding books in the library and devouring them and asking her mom to tell and retell stories about the deaths of their county’s citizens. Some say we can’t see time, that it’s an invisible fourth dimension. But we can see its evidence–the gears of a clock, the swing of a pendulum, the aging of a face. What’s your favorite macabre story? This entry was posted in books and tagged 3 stars, book reviews, Halloween, Halloween reads, holiday reads, macabre, memoir, nonfiction. Bookmark the permalink. I love a good memoir and this one seems perfect for this time of year! We used to live next to a cemetery and it’s interesting to see how it impacts your day to day life. It’s so appropriate for the season, especially if you don’t appreciate gory horror. I no longer notice but I used to have a noticeable reaction when driving by a cemetery. Most people have some kind of reaction, but Rachael pulls the car over to explore. That’s one of the reasons I liked this book.